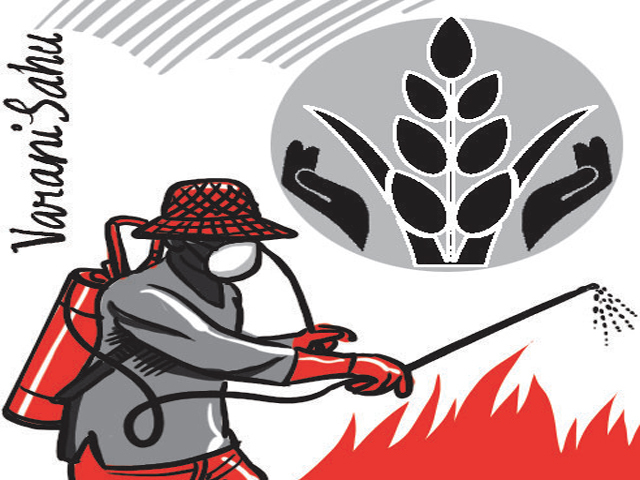 The pesticide-related death of more than 30 farmers in Maharashtra points to deficiencies in regulation of safety and optimal quantity and methods of use. These farmers were put in harm’s way by use of wrong combination of pesticides and faulty gear. Despite the importance of agriculture in the economy, India still does not have a robust regulatory framework for proper manufacture and sale of pesticides and gear. The Pesticides Bill has been pending before Parliament since 2008. The proposed legislation, replacing the 1968 Insecticide Act, would regulate the manufacture, quality, import, export and sale of pesticides. It would also create mechanisms to make pesticides available, minimise produce contamination by pesticide residue, address key issues such as minimising risk to human beings, animals and the environment, and ensure regular monitoring of registered pesticides and review of safety. Parliament must pass the Bill without delay. Further, the Centre and the states must invest in capacity building for farmers, to help them choose the right pesticide combinations, handle and store pesticides and inspect the gear used for delivery. Farmers must have access to information and expert advice. A strong extension service programme could help guide and nudge farmers towards practices that are both safe and beneficial. Research laboratories, universities and agricultural institutions need to focus on developing pesticides that are safe and effective. Pesticide companies must bear responsibility for manufacturing pesticides that degrade within specified time periods and make that information available. The Food Safety and Standards Authority is already supposed to ensure traceability of foods. Testing of samples of farm produce for pesticide residue must combine with traceability.